The University of Redlands School of Education's Center for Educational Justice opened its annual Ed.D. Speaker Series with Dr. J. Luke Wood's talk "Black Minds Matter: A Focus on Black Boys and Men in Education." Wood—a Distinguished Professor of Education in San Diego State University's (SDSU) College of Education, as well as director of the Ed.D. 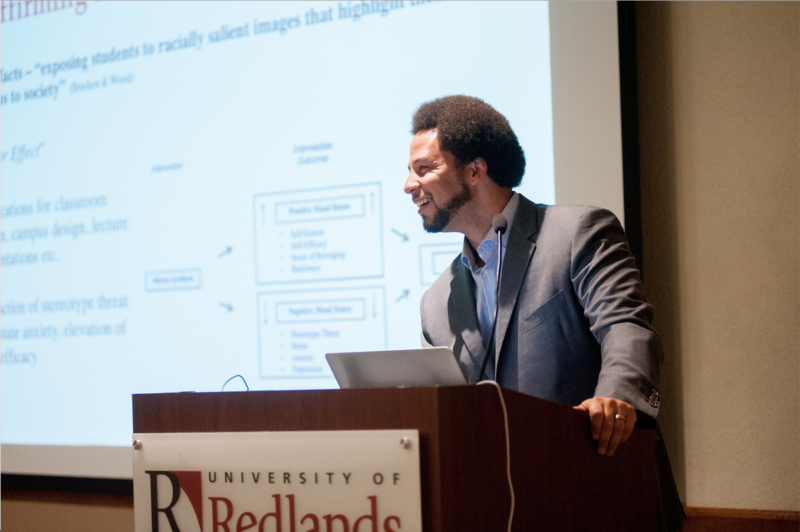 Program in Community College Leadership and of the joint SDSU-Claremont Graduate University program in education—began his talk with a brief introduction to the free online "public course," titled BLACK MINDS MATTER: A Focus on Black Boys and Men in Education. The eight-part series is presented in a webinar format and addresses the lived experiences of Black children in the educational system from preschool through college, while simultaneously drawing parallels between educational engagement and the Black Lives Matter movement. Wood and other leaders in the field developed the course in response to troubling patterns of high profile slayings of Black boys and men and seeks to raise the national consciousness and inspire civil resistance in classrooms across the nation. Wood highlighted the "mind-life" connection in classrooms and larger society, spotlighting scholarly work that demonstrated how criminalization of Black youth begins as early as preschool. Black boys experience early erosion of childhood privileges involving the need for protection and nurturing and the ability to make mistakes (Wright & Ford, Journal of African American Males in Education, 2016). Wood describes this phenomenon as the "the disregard for youthfulness." Another study (Goff, Jackson, Di Leone, Culotta & DiTomasso, Journal of Personality and Social Psychology, 2014) revealed the dangerous tendency for law enforcement personnel to view Black boys as older and less innocent than their white counterparts. The course uses the theoretical lens of unconscious or implicit bias to explore the intersection of Black lives and Black minds in the educational system. Wood highlighted ascription of intelligence, assumptions of criminality, pathology of culture, and athletic boundness, sharing an image of his November 15, 2017, Facebook post about the exchange between himself and an older white educator while on a plane. Before taking questions from the audience, Wood reminded the audience that everyone has biases. He noted that people often think of bias as something that makes them bad. Wood assured the audience that "Having bias does not make us bad, it makes us human. We must recognize our biases. Choosing to do nothing about it is bad." 1. Having culturally relevant activities for students in the classroom. 2. Affirming the effort and ability of students verbally and non-verbally. 3. Mirroring artifacts in their classrooms and the broader educational setting, for example ensuring that students see themselves represented in positive and empowering images and stories. For more information, see the online Black Minds Matter course and the University of Redlands School of Education website.